The new additive ensures compliance with the Jan. 1, 2018, implementation of CARB's Alternative Diesel Fuel Regulation. 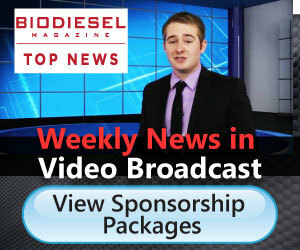 A 20 percent blend of biodiesel with VESTA 1000 reduced NOx by 1.9 percent and PM by 18 percent compared to CARB diesel. Renewable Energy Group Inc. marked the completion of upgrades at its Emden, Germany, biorefinery July 19 with a ribbon-cutting ceremony. REG invested €2.5 million for the installation of a new biodiesel distillation column and a thermal oil heater. With a bipartisan, two-thirds supermajority vote, California legislators passed AB 398, extending the cap-and-trade and LCFS programs from their initial end date in 2020 through 2030. The extension will help foster greater biodiesel growth. Under the proposed legislation to extend and phase out the biodiesel blenders tax credit, the value for the incentive would be $1 per gallon in 2017-'18, 75 cents in 2019, and 50 cents in 2020-'21. The tax credit would sunset Dec. 31, 2021. The NBB welcomes the new membership of SolFuels USA. Through a partnership with Agritrade Resources, Solfuels recently completed the retrofit of an Arkansas biodiesel plant, which will produce 3 million gallons per month at full capacity. Produced by Christianson PLLP and taking place Sept. 27-28 in Minneapolis, the event focuses on the best ways for biofuels producers to become more familiar with the latest financial options in today's ethanol and biodiesel industries. American Soybean Association CEO Steve Censky has been nominated by U.S. President Trump to serve as Deputy Secretary of Agriculture at USDA. Censky has led the ASA as CEO since 1996. Censky worked at USDA under Reagan and Bush in various roles. After 18 months of testing, microalgae manufacturer ecoduna has selected Schott's glass tubes for a new photobioreactor site in Vienna, Austria, that will be Europe's largest plant dedicated to the harvest of omega-3 fatty acids from microorganisms. The U.S. EPA has announced plans to hold a public hearing Aug. 1 in Washington, D.C., for its recently released proposal to set 2018 renewable volume obligations under the Renewable Fuel Standard, along with the 2019 RVO for biomass-based diesel.